Stephanie, fit mom of two and featured blogger. 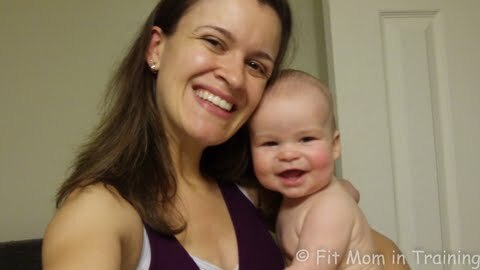 Read this featured fit mom blog written by Stephanie. Stephanie is a mom to 2 young boys with a passion for health, fitness and empowering women to live active, “no excuses” lives. She chronicles her journey at Fit Mom in Training and can also be found on Twitter and Instagram (@fitmomintraining). I had always been aware that postpartum depression (PPD) was out there. Having battled depression in my teen and young adult years, I knew there was a very real possibility that PPD would invade my life after I became a mom in 2010. That knowledge still didn’t prepare me for the roller coaster ride that took 6 months out of my life. Nearly 2 months before the birth of my first son, my family suffered an unspeakable loss. My nephew, who was born 3 months premature passed away after contracting a fatal infection, 39 days after he was born. The loss and the pain in my family was unspeakable and I dreaded and feared the birth of my own child. After my son was born, I entered into what can only be described as a fog of dull, colourless existance. I felt nothing toward my baby. I cried endlessly but I didn’t know why. My son had severe colic and reflux and so my days were spent trying to calm a screaming baby that was as alien to me as the fog I was drifting through day after day. My midwife was quick to spot the signs and refer me to a professional to cope with the multitude of emotions my mind was working tirelessly to supress. Guilt, Anger, Dispair, Loneliness. I was diagnosed with postpartum depression. I received counselling for a period of months which helped a great deal but there was still a lingering emptiness haunting me. One of the ways I coped with my colicky baby was to go for walks where his crying didn’t seem so bad and he would eventually settle to sleep. I gradually realized that being out and being active helped boost my mood, relieve my stress and give me an outlet to channel my negative energy. As the weeks passed by I became stronger, both mentally and physically. I incorporated running, strength training and yoga into my routine and over time, my symptoms completely disappeared. I felt alive again, I felt at peace and most importantly, I was able to allow myself to bond with my son and enjoy him and our time together. It was by no means an easy road to walk but the strength I found within myself has helped propel me to heights I never imagined. I received the outlet necessary to talk about my emotions but what really helped me cope and overcome was fitness and being active. During my second pregnancy, I remained active, doing prenatal bootcamps, running, biking and maintaining a healthy diet. Not only did it help me gain 20 pounds less than with my first pregnancy, it also allowed my body to bounce back faster after giving birth to my second son this past February. Best of all, I have not experienced any recurrance of PPD and have been able to enjoy both my boys on and off the running path. Not only have I been able to protect my mental health but being physically active on a regular basis gives me the energy I need to chase my kids and enables me to model a healthy lifestyle in a way that I hope lays a foundation for their future decisions regarding the way in which they choose to live their lives. The only thing missing these days? A double jogging stroller! Read more information and resources on postpartum depression. Best number of years between kids?